By davidf, October 18, 2012 in Plugins - Publishing ONLY! This plugin is similar to Effects > Distort > Frosted Glass, but with a bit more control. It modifies each pixel based on the value of one or more pixels within a certain radius. 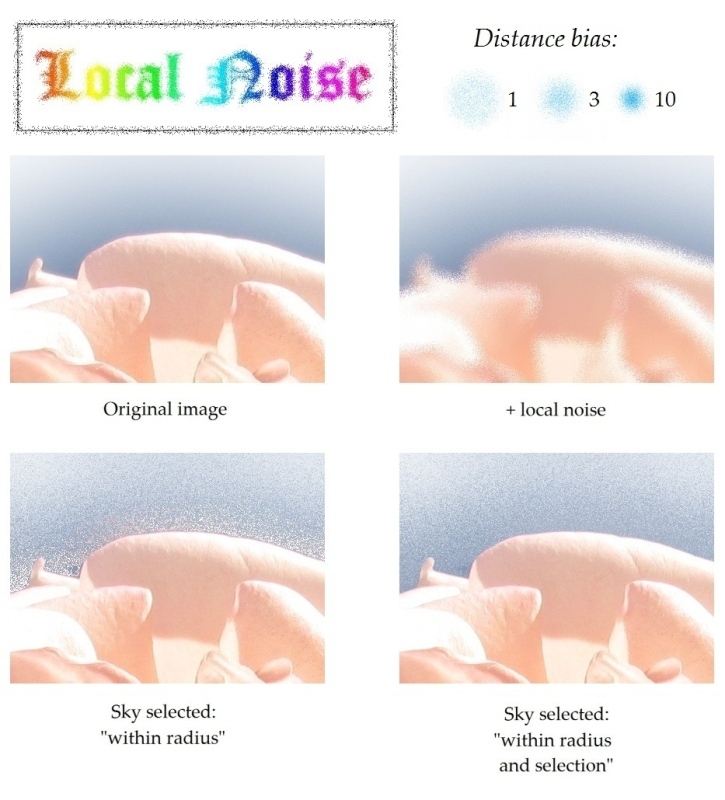 The influential pixels can be restricted to the current selection (compare the bottom left to the bottom right image below) or biased towards closer points (top right). Radius - The maximum distance for influential pixels. Strength - The amount of influence; 50 means the current pixel is blended evenly with the influential pixel(s), 100 means the current pixel value is ignored. Coverage - the percent chance of a pixel being altered. Use points - method for choosing influential pixels. "Within radius" picks a point up to that distance away; "within radius and selection" is the same but only uses points inside the current selection; "anywhere in selection" ignores the radius and just picks a point inside the current selection; "anywhere in image" picks any point in the picture. Number of points to blend - the number of influential points (RGB values are averaged). Higher values give a smoother effect. Distance bias - higher values increase the likelihood of an influential point being close to the current point. (This number of points is generated and only the closest one is kept, so a value of 1 means the points are evenly distributed - see top right image above). This parameter is only used if use points is set to something that mentions a radius. Nicely done davidf! Thank you. I like this! - thank you for sharing.